Humans perform complex analytics daily. As an example, they analyze traffic patterns many times each day and decide when to cross intersections. This situation is complex, with moving actors and a highly dynamic environment. Situational awareness implies an understanding of relevant history (car behavior and speed), learned behavior (look left, right, and left), knowledge of traffic laws, and the current environment (number of cars and speed of cars). This situational data can help people decide how a new event, such as crossing a street, will impact the objective of staying safe. Imagine making these decisions based on five-minute old data, rather than real-time data. New analytic capabilities can enable computing systems to augment human decision making and help over-burdened analysts cope with the inevitable crush of data. Better, more accurate decisions can be generated when all of the available data is used to create a persistent context. Context serves as a “ground truth” of understanding, offering a current description of the entities that are relevant to the decision analytics (people, organizations, and connections between the entities and events). This IBM® Redguides™ publication introduces ideas and concepts that IBM Research is exploring about deriving information and knowledge from data. 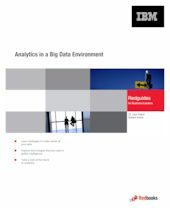 This guide provides examples of using these concepts to effectively analyze and fuse seemingly unrelated data, helping analysts to make well-informed decisions. In addition, this guide highlights key technologies that IBM Research is exploring and takes a glimpse of the future.